Rice is a symbol of wealth and plenty. Anything sweet and sticky brings family unity. 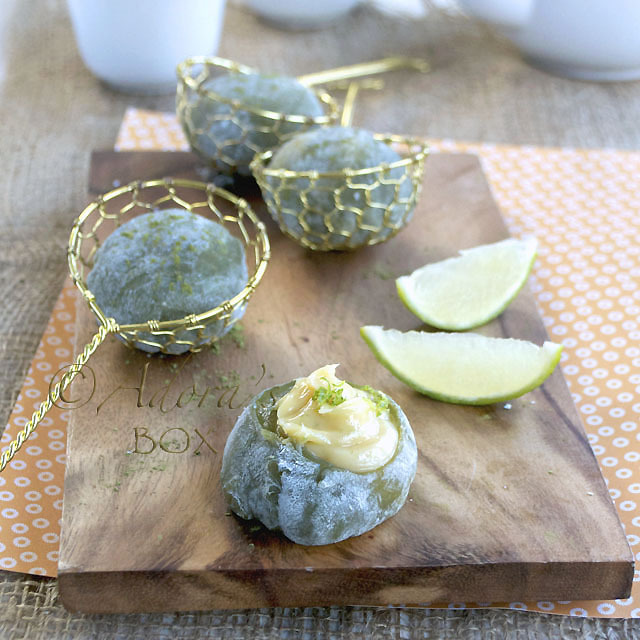 Mochi, a popular Chinese new year dessert ticks all the boxes. 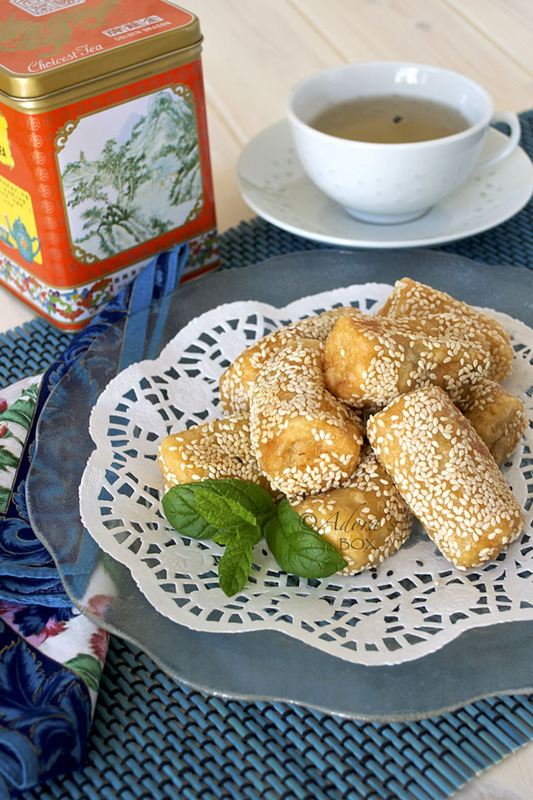 The Japanese, Korean , Cambodians, Thai, Chinese and other Orientals always feature this sweet in their traditional ceremonies and celebrations. 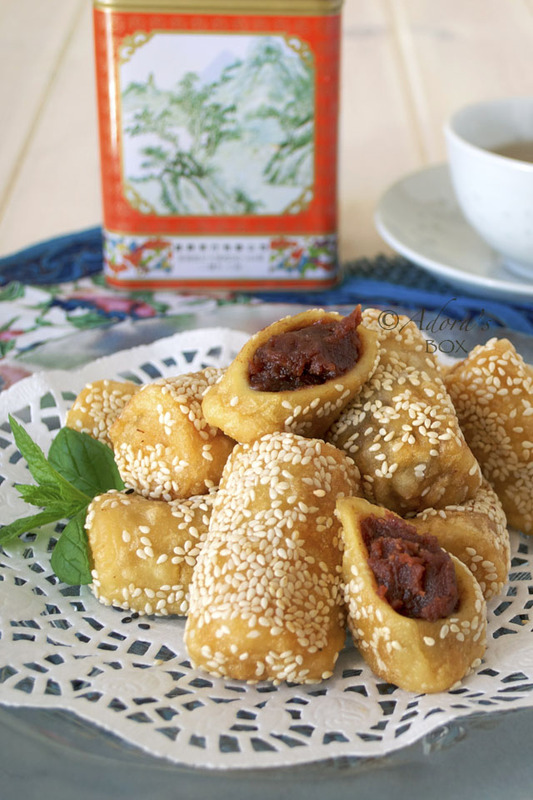 They may vary in cooking technique and ingredients but basically it is a sweet filling encased in a glutinous rice powder pastry. 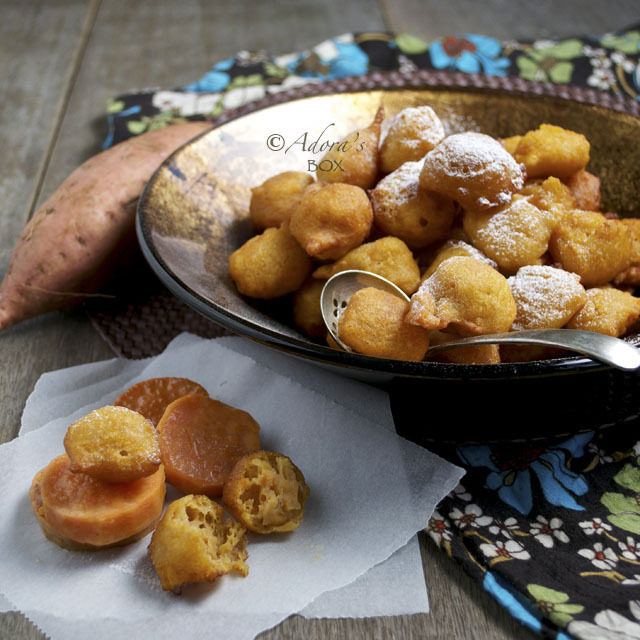 The pastry of this mochi has cooked sweet potato in the pastry and the filling is made with red beans or aduki beans. 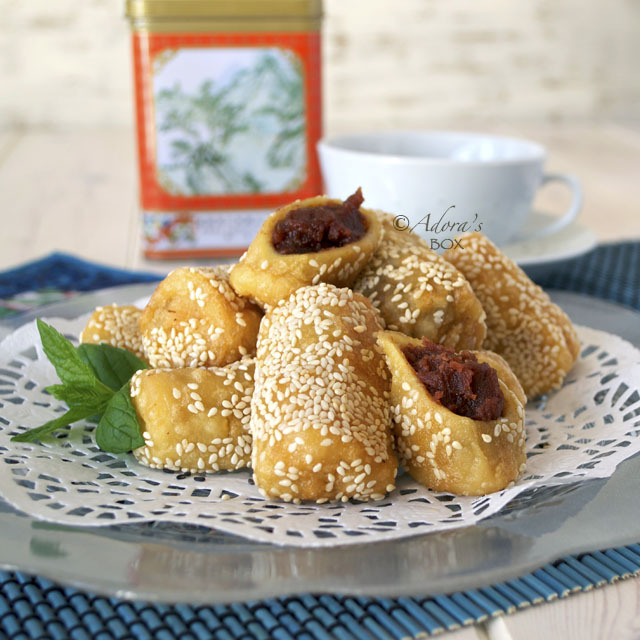 Lotus seed paste can also be used. 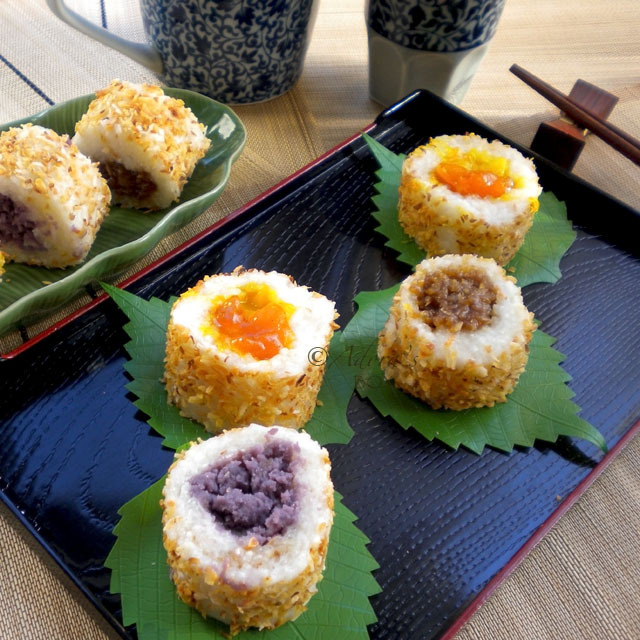 This mochi is cylindrical instead of round and is coated with sesame seeds before frying. Red bean paste can be bought in tins in Oriental supermarkets. To make home made red bean paste, you have to soak the beans for a few hours. Drain the beans. Mix the beans and with 2 c. of water in a pot, bring to a boil and simmer until the beans are very soft. Stir occasionally to ensure that the beans do not stick to the bottom of the pan. I used a pressure cooker to cook the beans for half an hour. When the beans are soft, add the sugar, butter and vanilla and keep stirring on medium heat until the mixture is very thick. This will take about 20 minutes. Cool the mixture, then refrigerate. Mix all the ingredients for the pastry and knead until smooth. Divide into 24 equal portions. Flatten one portion gently between your two palms, then coax with your thumb to form a flat rectangle (or circle if you want to make a round mochi). Dip your fingers in water, then seal the edges. Dip in the sesame seeds, then fry until golden. This doesn't take long. 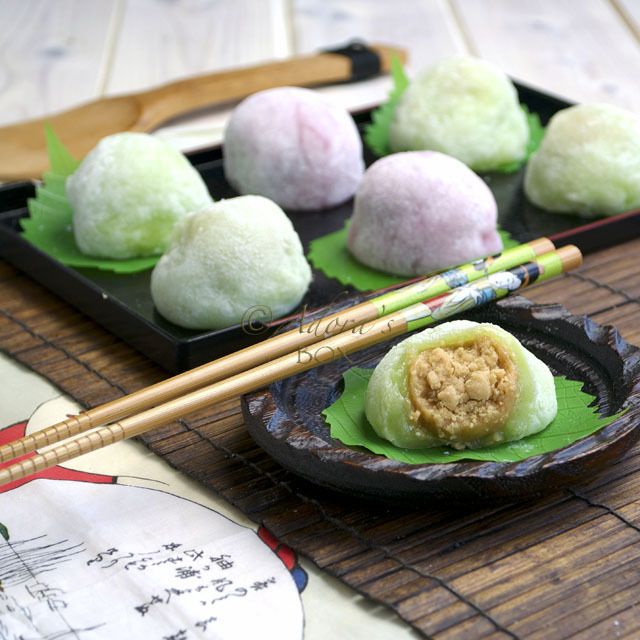 When the mochi is golden in colour and starts to puff up, it is cooked. Do not cook further or the pastry will burst and the filling will start to ooze out. Drain on kitchen paper. It is then ready to serve. I didn't know rice was a symbol of wealth. Good to learn something new. I have never had mochi but they look so round and cute and i bet they taste sweet and salty at the same time. Thanks for sharing. I've never had these before, but I do love the red bean paste. My husband would like these too. Have to try these. Hope you are having a great week. These look so tasty. I love mochi!